Silence day of Avatar Meher Baba on 10 July | MEHERBABA Silenceday July 10 Information . Silence Day is the name the followers of Meher Baba give to their practice of commemorating July 10th of each year by maintaining verbal silence for twenty-four hours. From July 10, 1925 until his death in 1969, Meher Baba was silent. He communicated first by using an alphabet board, and later by hand gestures which were interpreted and spoken out by one of his mandali (devoted disciples), usually by his disciple Eruch Jessawala. For many years, Baba asked his followers to undertake austerities on this date. These took various forms: in addition to keeping silence, Baba had asked his followers to fast, to pray, to repeat the names of God, and similar practices. In his last request to his followers on the subject, in 1968, he requested that they keep silent. While Meher Baba did not establish any special ongoing requirement of his followers to keep silence on this day, the majority make it a practice to keep silent, on an informal and voluntary basis. Some stay in seclusion for the duration, while others attempt to engage in their typical activities; there are therefore many humorous anecdotes associated with keeping silent on Silence Day. 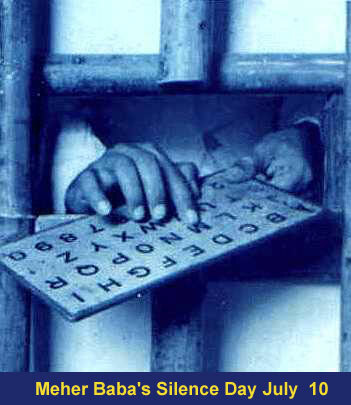 Meher Baba's alphabet board About his silence Meher Baba wrote, Man’s inability to live God’s words makes the Avatar’s teaching a mockery. Instead of practicing the compassion he taught, man has waged wars in his name. Instead of living the humility, purity, and truth of his words, man has given way to hatred, greed, and violence. Because man has been deaf to the principles and precepts laid down by God in the past, in this present Avataric form, I observe silence. On 10 July 1925, Meher Baba began his long silence, which he kept for the next 44 years. Every 10 July pilgrims from all over the world come to Meherabad to commemorate this occasion through a day of silence, as per his wish. Those who are unable to come observe a one day or 24 hours Silence from midnight of 9th until midnight of 10 of July at their own places.